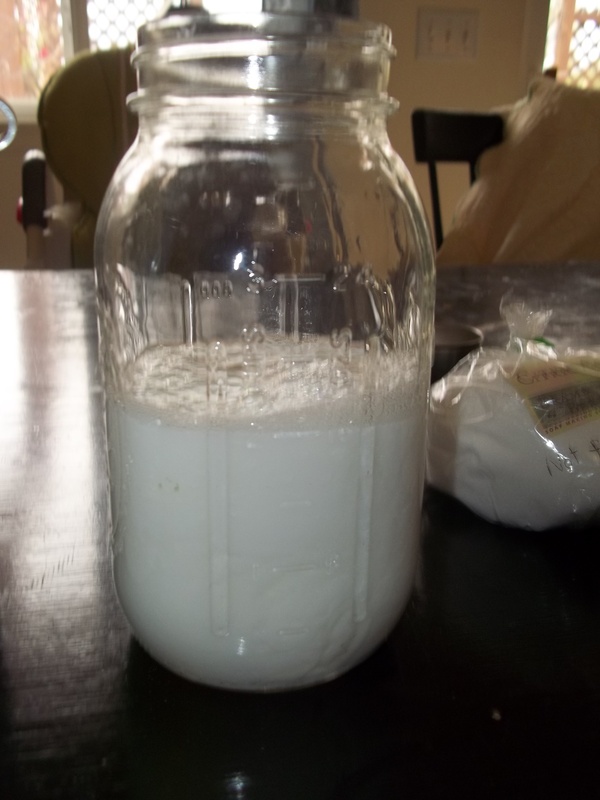 I have updated my post on homemade dishwasher detergent without Borax. I think I have finally perfected the recipe, at least for my dishwasher. Check it out recipe here. The other morning hit me with a tough challenge – do you remember your chemistry, Courtney? Nope I answered quickly, I’ll go get Robert. Robert and I sat next to each other on the couch and hammered out some math problems. We were trying to work out some concentration questions for my laundry soap. I was using chemistry equations and he was using logic. We both came up with the same answers but I had to cheat and google the equations because alas I had forgotten them. So why was I bothering with chemistry equations, well I had another soap disaster but I won’t bore you with the details this time. Let’s just say that I trusted another EHow recipe. I had to rework the recipe a bit and here is what I have come up with. 1/3 cup baking soda *update 8/2012 I just started adding this to the recipe, can’t tell if it makes a difference but I feel good about adding another odor absorbing safe cleaner to the mix. You might be wondering why not mix the two together and add them at one time. I found out that the washing soda doesn’t dissolve well in small amounts of liquid. In your large load of laundry it will dissolve just fine. So I eliminated the water in the recipe. Really why do I need to be lugging around a big jug of water I would rather use small amounts of concentrated soap. This is after the Dry Mix was heated in water. Not dissolved at all. Another method: I used my old Charlie’s Soap bottle because it has a measured pump on it. I calculated how much castile soap and water I would need for the 1 gallon bottle I had. 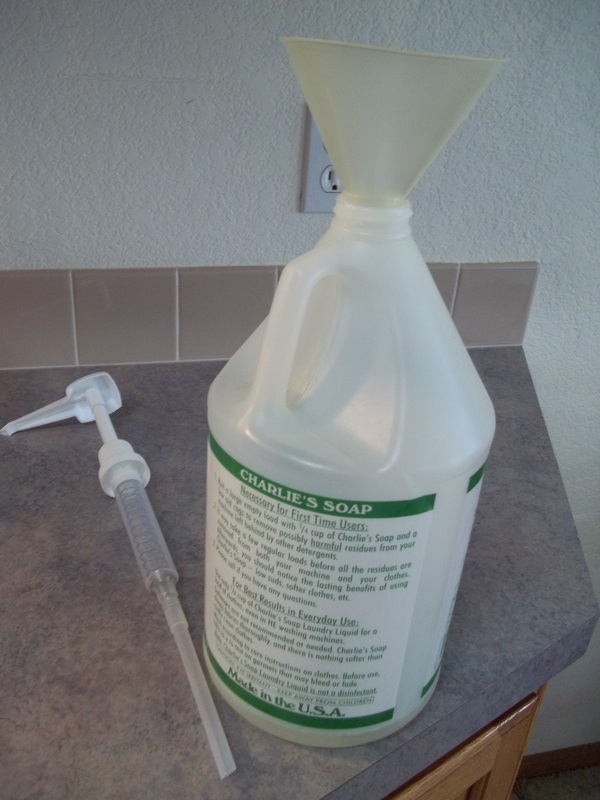 If you are in the same situation, Charlies’s Soap dispenses 30 ml per load so fill the bottle with 4 cups castile soap and the rest with water. This is really only worth the effort if your bottle has a measured pump otherwise use the concentrated method above. I washed my first load of diapers yesterday (a true test of washing ability) so I will let you know how well it worked. 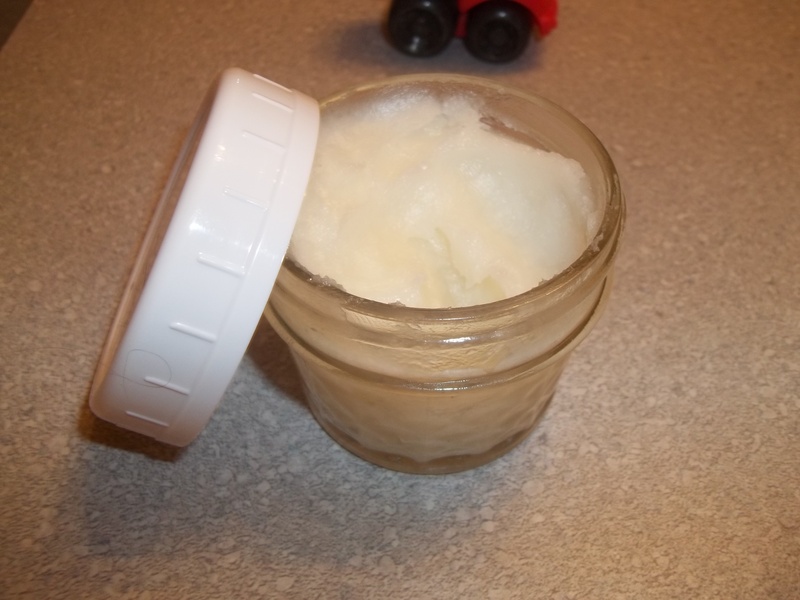 Check out my homemade dishwasher detergent without borax too. Update 8/2012 – I’ve been using this for over a year now and really love it. Heavily soiled items I do use one or two more pumps. And I have found that it doesn’t clean fruit stains very well – that’s what the enzyme detergents do good at I guess. Stain treating is the only way to go. My cloth diapers are on their 2 year of heavy daily usage and are still clean. I’ve tried this for about a week now and am pretty happy with the recipe. I will admit my glassware is a little foggy looking but this is a fair trade off we have decided. Everything else comes out clean and I know they have all been through a high heat rinse so that’s good enough for us. I am sure they won’t meet my mom’s standard of shininess but oh well. See my new update below. 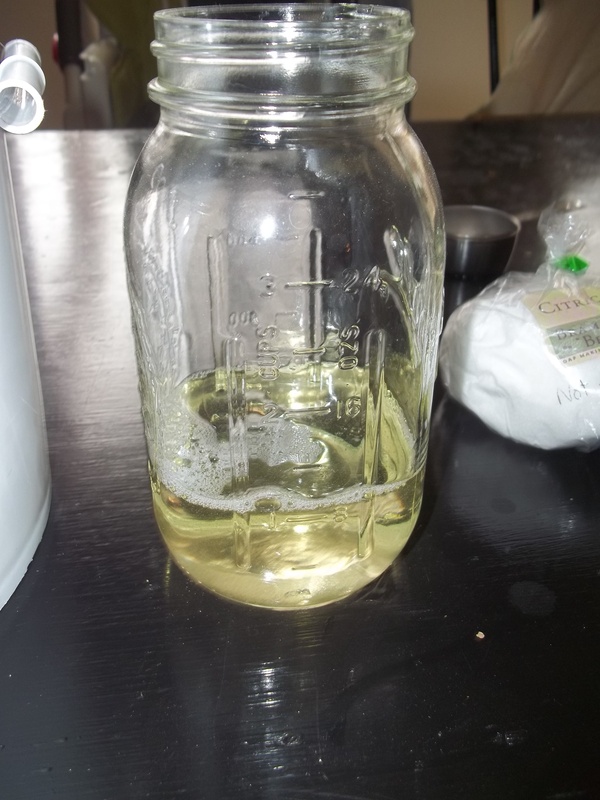 I found that vinegar is a crucial part of the system, and since it can’t be added to the soap because it will turn it back into oil, it needs to be part of the rinse cycle. Because I am too lazy to wait around until the dishwasher hits the rinse cycle I just put a few glugs into the bottom of the washer. Also if you fill the rinse aid dispenser that will be released during the rinse cycle as well. It’s not enough to do the job though, that’s why I add more. As for the cleaning agents I decided to try my two part method that I developed for the laundry detergent. 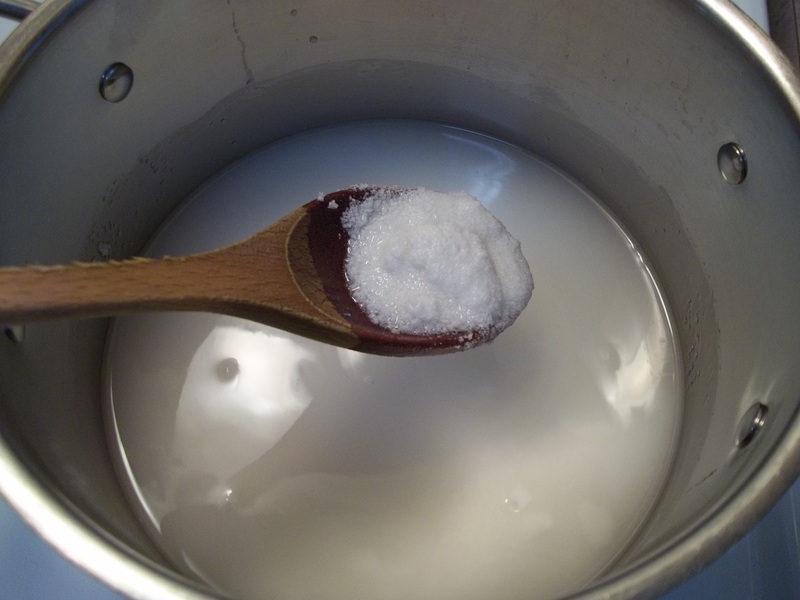 First I add the liquid soap mix and then I pour in some of the powdered mix. Think of it like those little packets of detergent that have soap on one side and powder on the other. I put this into an empty dishwasher soap container that I had on hand. Put into clean, dry jar. Don’t waste a canning jar, use a jar that you can’t can with to be extra frugal. 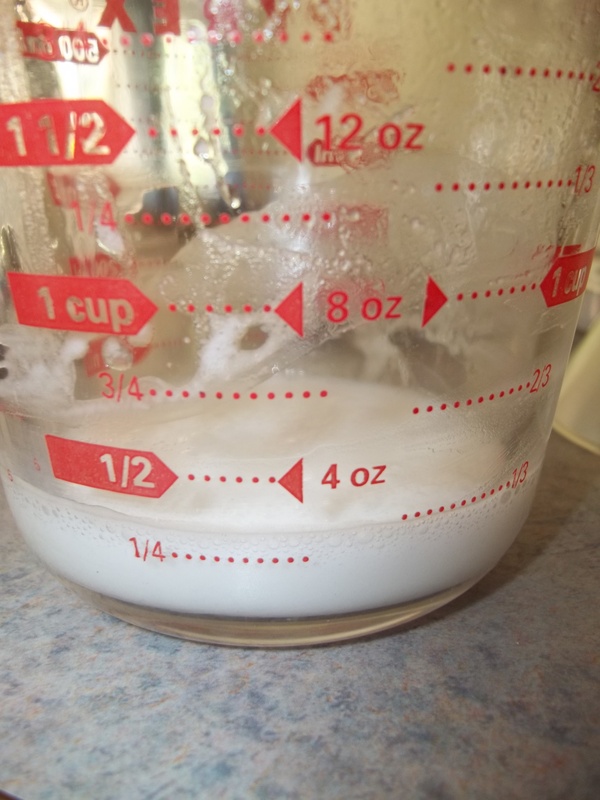 For each load: Use 2 teaspoons dry mix, approximately 3 teaspoons liquid soap mix and a tiny squeeze of dish soap (my newest discovery, see update below). Pour a glug of vinegar into the bottom of the dishwasher too. The amounts don’t have to be exact just measure it once and then eyeball it after that. Also, fill up the rinse aid with vinegar. It only releases a small amount each load but it’s better than nothing. If you find this isn’t working for your unique water requirements then just experiment. I read an article that said less soap is better than more soap. The soap is what causes the soap scum on the glasses. So adding more won’t make matters better. Try less soap, instead. Maybe more dry mix would be a better option. Hopefully you find something that works for your family. Another thing to think about is that I have heard, not sure where, but that putting soap into the dishwasher is not advised. Detergent is apparently different than soap. I take this to mean, no dish soap, especially dish soap alone, but I thought I would mention it so you can decide for yourselves. Update: I have been using this dishwasher soap now for about 2 months and I think I have worked out some more of the kinks. My discovery came with the addition of plain ol’ dish soap (I have some natural brand in a giant bottle from Costco). I use the same amounts posted above but then I add a tiny squeeze of dishwasher soap into the dispenser. It makes my glasses come out shiny now. It’s perfect. Several steps I admit but natural and nearly equal to the old stuff. Hey it’s me again, the crazy lady who keeps messin’ things up. This time it was my fault, not the recipes fault. Today I set out to make my face wash. It is a recipe from the book I mentioned in an earlier post, called Green Beauty Recipes. I set out to make her Basic Cream #1 recipe. 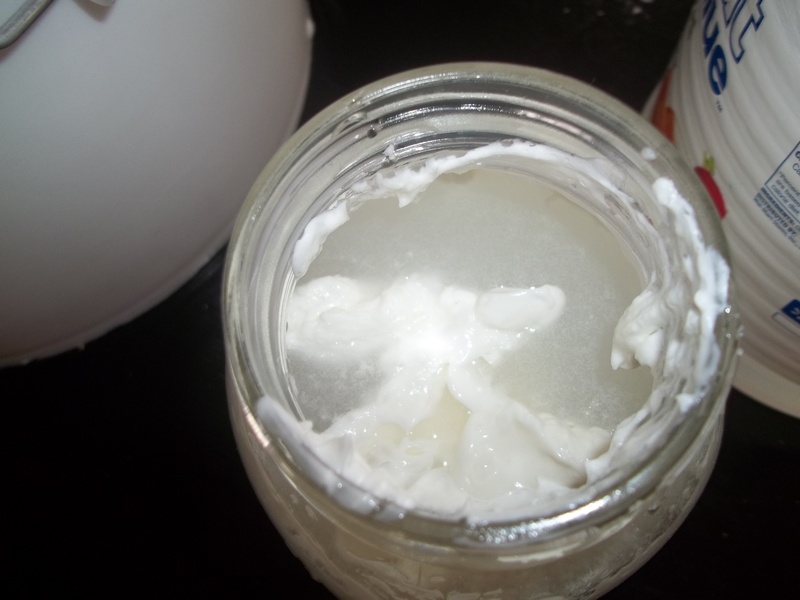 The recipe can be used as a moisturizer on it’s own or you can add Castile soap to make a nice soft face wash. So here I am getting started, all is well. After measuring out the minuscule amounts. I really wanted to double or triple the recipe but I didn’t want to waste the ingredients if it didn’t turn out. Good thing, I did. 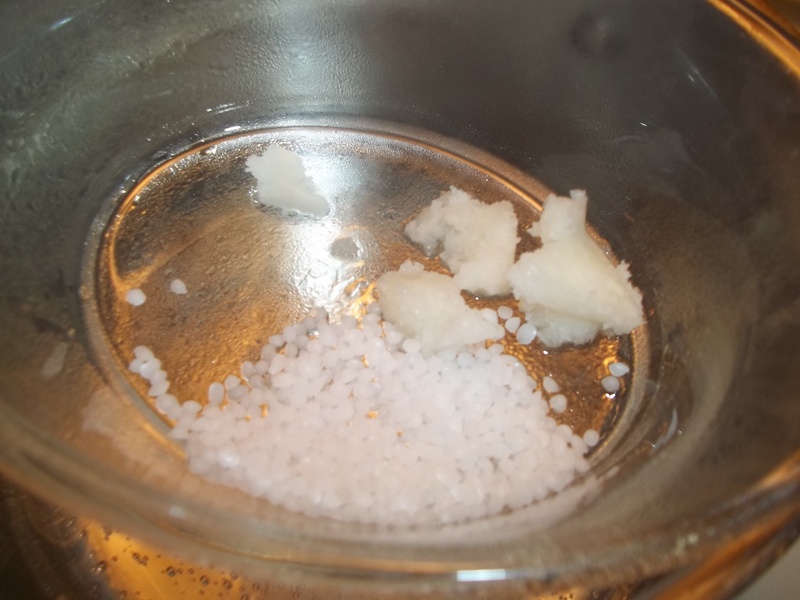 Here is the coconut oil and my emulsifier cetyl stearyl alcohol (sounds scary but is actually safe) melting away on my makeshift double boiler. Who really has two double boilers laying around anyways? Okay here is the finished product. After stirring and cooling. Looks similar to the starting product just with smaller sized beads. Not a cream if you ask me. See the lovely separation. I essentially made oil and water. After trying these tricks I redid the recipe and voila it worked. I still got a little separation but a quick swirl before using it solved the problem. Next time I will use more emulsifier. But it’s a natural product so I am fine with a little separation. White and creamy. Not very thick though, the book says to add more emulsifier to make it thicker. I put the soap into a plastic squeezy bottle and used it in the shower. It works great, not drying at all. I think this will be my face wash and body soap from now on. 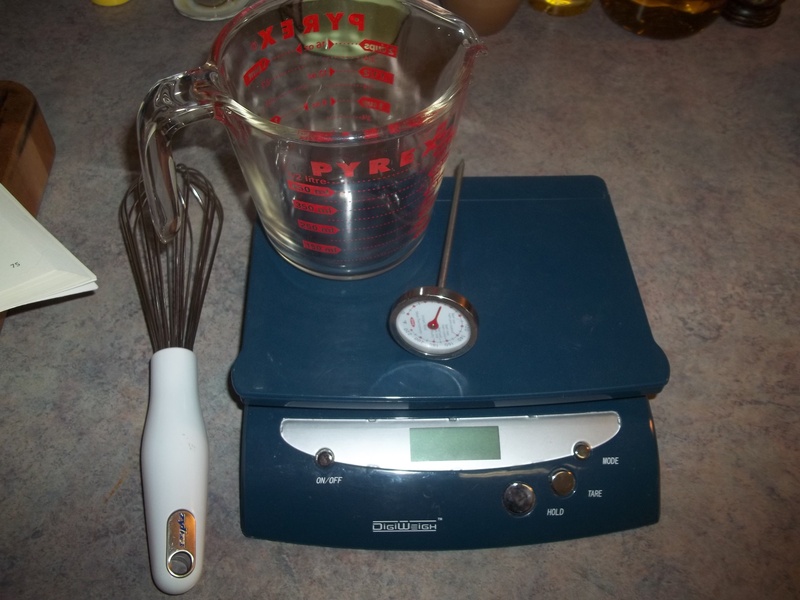 Now I can quadruple the recipe. 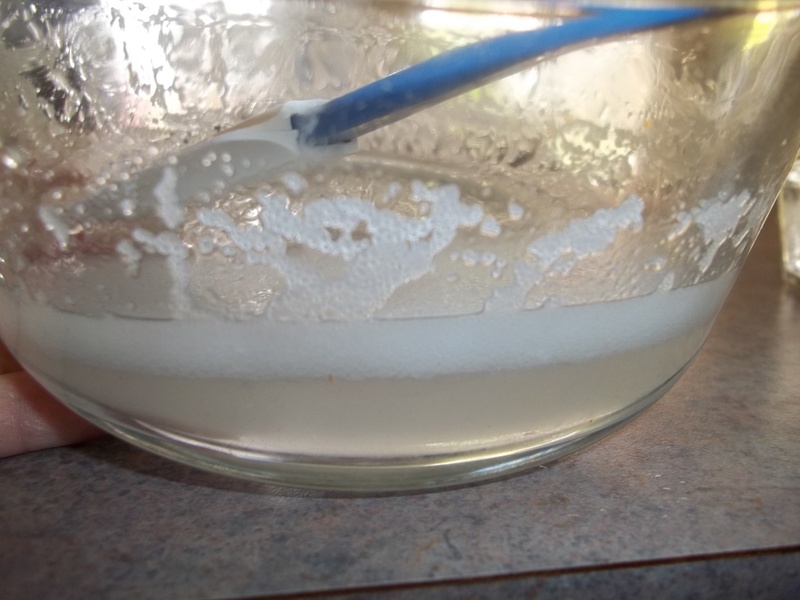 Here’s what happens when you mix an acid and a base, I mean make dishwasher soap from a bad recipe on EHow. Even though this was a waste of my ingredients I did have a pretty cool science experiment. The recipe was clearly never tried. Here are the ingredients they say to use: vinegar and Castile soap. Well being a scientist I should have seen this coming, but I guess I lost my brain somewhere between college and having a toddler. Half Acre Homestead does a good job of explaining what’s going on. But here’s what’s going on, try to remember back to science class for a minute, don’t worry this won’t hurt. Soaps are bases and vinegar is a acid. The two are not meant to be combined and what happens is a precipitate is formed. No explosions, sorry not that cool. In this case the precipitate was oil. This is the reverse process of soap making. Not a cleaning agent. Back to the drawing board for this one. I don’t give up easily so I am going to try just using diluted Castile soap and use vinegar in the rinse aid compartment. We will see how this goes, I may add salt for hard water and possibly washing soda to help clean but I want to start with less ingredients first. I also thought about adding my citric acid but wake up Court, it’s an acid too. If anything it could go in with the vinegar if I feel I need more spot remover. Washing soda: This guy is tricky for me. 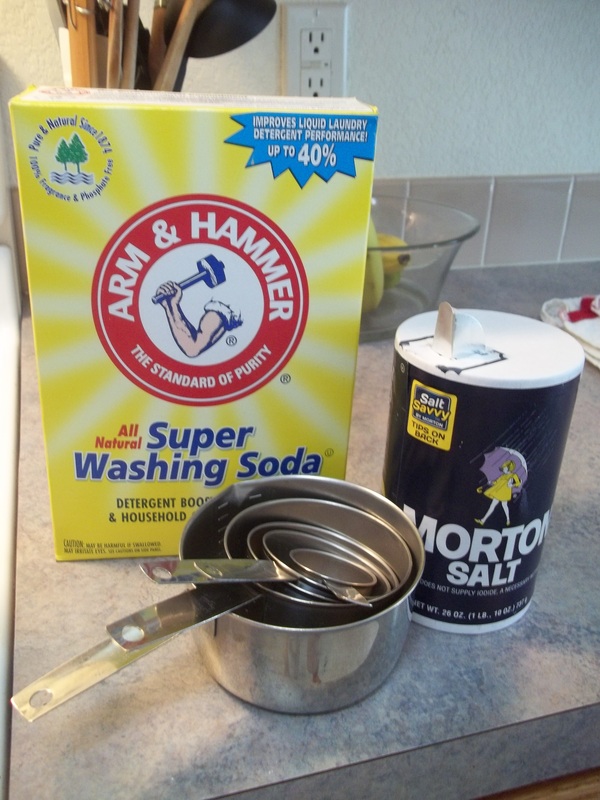 Washing soda is similar but not the same as baking soda and we know what a good cleaner and odor absorber soda is. So my guess is they aid in the cleaning and deodorizing. It’s basic so it’s a good partner for soap. Here are some pictures of what happened. Another bummer is that I quadrupled the batch so all that is wasted. Step 2. Vinegar added to the Castile Soap. Instant cloudiness. Step 3. Shake and voila creamy oil rises to the surface. Cool but not what I wanted. So what’s the lesson I learned, you can’t trust everything you read on the internet. Somehow I think I should have known that. 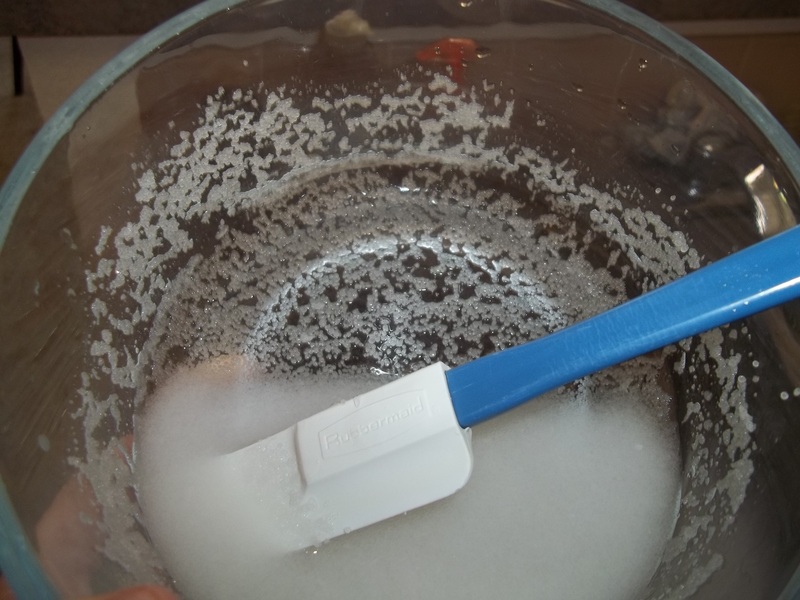 Update: Check out my post on a successful dishwasher detergent recipe – without Borax. I have come to the conclusion that right now the only product I feel comfortable spreading on my pregnant belly is coconut oil. What’s wrong with all the bottles I have on my shelf, well they aren’t natural. Even my pure and simple Cetaphil has come to let me down. EWG has listed it as a 3! Now I know that is not high on a scale of 1 -10. But when I see other products listed as 0, I am envious of them. EWG does a great job of listing products by category and they start with the lowest scores first. I started looking up the products that had the lowest scores and almost purchased some of them online. I stopped short when I suddenly realized, I can make these myself. While I busied myself searching books and recipes online I stopped by the local health food store and picked up some coconut oil. This pot of delicious smelling wonderfulness would have to do until I could come up with a recipe that I felt was safe, natural and the ingredients were easy to obtain. I want a recipe that doesn’t use lye and contains no essential oils. Tough, not really. Now back to my new love, coconut oil. Yes, I love it. I read in one of my pregnancy books that to avoid stretch marks (if that is possible) is to keep the turkey basted. That means always keep that belly skin oiled up. The coconut oil does a wonderful job of keeping my skins soft all day because it is so thick. The thicker the oil the more it sits on top of the skin and captures any moisture before it can escape. That does mean that it is a little greasy but on a belly, it’s perfect. I also started putting the oil on my hands, face, dry spots, etc. I also use the oil in the shower to wash my face. I smear it all over my face and then gently wipe it off with a warm, wet wash cloth. It’s perfect for the dry weather. Here’s how I store it. I have one tub for the kitchen cabinet that I want to keep clean so that we can eat it too. It’s Spectrum brand by the way. I bought the skin care version because that was the isle I was shopping in. I should have saved money and purchased the glass jar in the oil section of the market, it’s cheaper. But Spectrum’s website says it is food grade and safe to eat. I have a fudge recipe that calls for coconut oil so I want to make that soon. 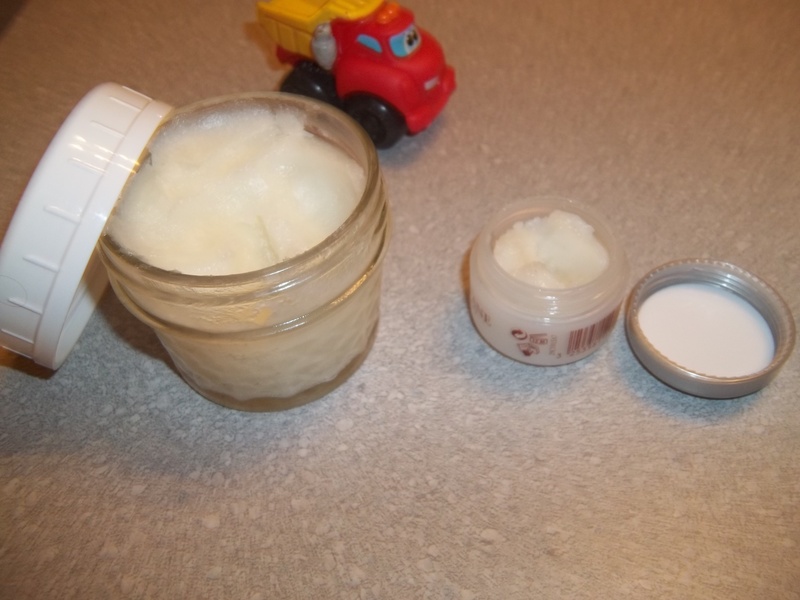 Back to my point, I portioned out some of the oil into a small Ball jar and I used the plastic reusable lids that Ball sells as a cap. Then for a shower container I used an old plastic trial size container from L’Occitane. It’s small but it won’t break in the shower when little hands rearrange all the bottles, as it our nightly habit. Easy as that! You should be able to find jars on your shelf that would work to store the oil. Don’t go buy something unless you have to, reuse instead. 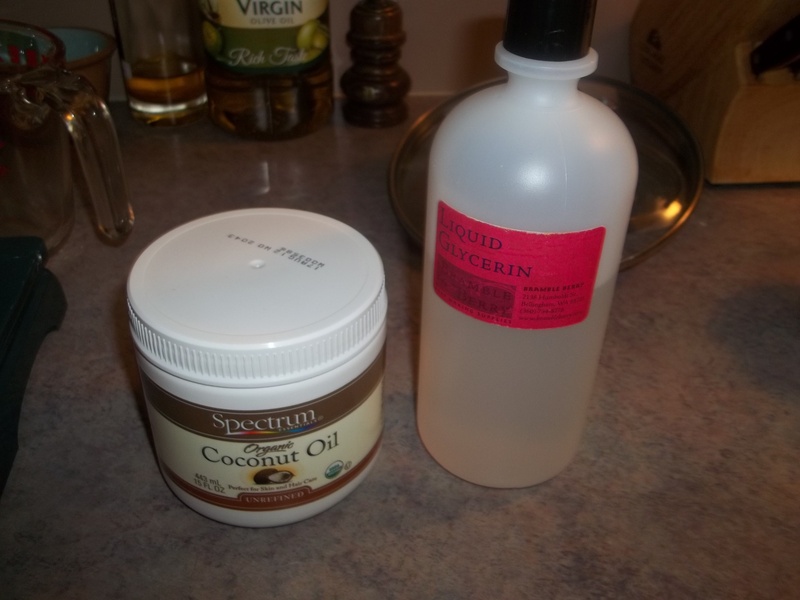 Without hurting coconut oil’s feelings I have some cautions here, coconut oil can be allergenic to some people. It can also clog some people’s pores. It might not be the perfect choice as the weather and humidity heats up. At that point a lighter oil might be better. And lastly it is best suited for dry, sensitive skin. If all those apply to you, give it a try and let me know how you like it. Find one that is unrefined, organic and expeller pressed, not heat extracted. And the best part is, you can eat it. And I plan to do that soon.